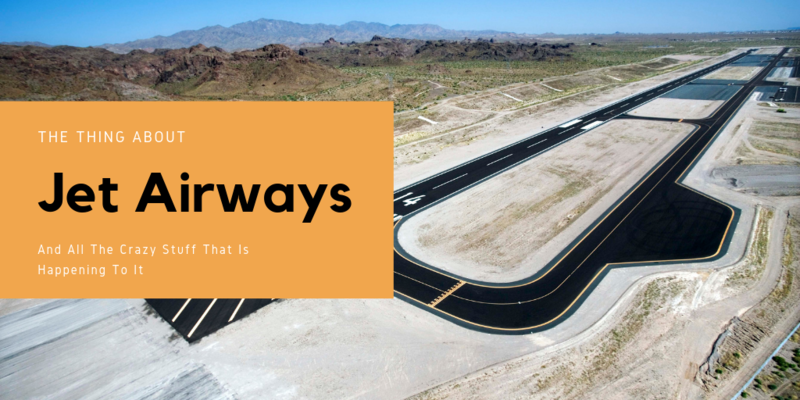 Aviation is one of the few Industries where the odds of success are so low that anyone who ventures would better be well funded and well executed to sustain the grueling times that shall come sooner than later. The Top 3 Airlines of the World have all in the past entered into Bankruptcies. Government owned Airlines are even worse since the loss is paid by the tax payer and operations can continue uninhibited till a politician decides to pull the plug. In India, we saw a rush of Airlines starting operations when India liberalized who could start Airlines through its Open Skies policy in 1991. The first scheduled private airline was East West which closed down 5 years later. Modiluft was another Airline that came to the fore during those times and while the operations ceased in 1996, its Air Operators Certificate was acquired by Spicejet. Nothing needs to be added when talking about the Rise and Fall of Kingfisher. Many smaller Airlines go down without much noise – Air Costa for example flew for a while before grounding operations in early 2017. Jet Airways is the only survivor of Airlines that made a start in the 90’s. For a very long time, it along with Air India had a free run with barely any challenge. The arrival of Gopinath who started Air Deccan can be seen as a pivot which started the decline of Jet Airways. Mounting losses, increased debt has pushed the airline to the brink. In last three quarters Jet airways made losses to the tune of Rs 3,500 Crs. Rising fuel prices coupled with price warfare has bought left Jet Airways tottering. The playbook we are seeing today is similar to the one we saw in case of Kingfisher – Delays in payment of Salaries to staff followed by defaults on payment of Interest to Banks. Last month Jet defaulted on payment of interest and principal to a consortium of banks. Jet defaulted on payments for December month to banks. Post the default. ICRA has downgraded Jet airways debt to D from C.
Jet Airways has a debt of Rs 8,000 Cr on its book. Currently Jet has a negative net worth of Rs 9,000 Crs. In next three months Jet airways needs to repay 1,700 Cr of debt and for FY20 its roughly RS 2,500 Crs. It has borrowed from a group of 26 banks. Jet has paid 480 Crs as finance cost for the first half of current financial year. For last financial year Jet has paid around 850 Crs as finance cost. According to the latest RBI regulations banks need to initiate recovery process one day after the company defaults. Jet airways loan account is put into SMA-0 category (default of 1-30 days). With the Kingfisher incident still strongly in the mind, Banks are more cautious this time around and have asked Jet airways for resolution plan to restructure the loan book. So, how did Jet Airways end up here? Airline business as such is a high cost and low margin business. Operating profitability of airline are dependent on multiple factors like, crude, currency variations, taxation, policy changes etc. e Airlines generate their revenue from paying customers and hence their ability to make a profit hinges on both the price at which they are able to sell their tickets and the percentage of seats they are able to sell. Customers worldwide are very price sensitive and since Airlines need to run the routes they have committed to earlier, empty seats is revenue foregone. But selling below cost while filling up the seats guarantees a loss. Are Flight Tickets Really Low Cost? Travelling by Air in India is a low cost affair. If you don’t think so, then check the below scenario. A AC 3 Tier train from Bangalore to Delhi costs Rs 3,400, while a economy class ticket in a flight would roughly cost you the same. (Provided you book at least 20 days in advance). Advantage being you travel to Delhi from Bangalore in less than 4 hours in flight. The same would have taken 2 and half days via train. Of course, this isn’t unique to India. In Europe and America, its cheaper to travel by Air compared to Rail even though Rail wins as the low cost alternative when one needs to travel for short distances. To simplify analysis of financials, airlines calculate their revenue in terms of Revenue Per Available Seat Kilometer (RASK) and Cost Per Available Seat Kilometer (CASK). RASK can be put together as total revenue divided by Seat kilometers the carrier has traveled. Similarly CASK is total cost divided by Seat Kilometers. If RASK is equivalent to CASK, then at least at that point, the firm is break-even in terms of direct operating costs. It is generally assumed if RASK is greater than CASK by Rs 1, then the firm is profitable. (As direct costs doesn’t include all expenses). The fight has always been for that Rs 1 margin for available seat kilometre (ASK). Jet Airways made Rs 4.16 in last quarter for every seat it flew for 1 kilometre. Unfortunately, it had to spend Rs 4.75 for earning that. The gap between RASK and CASK has been widening since last three quarters and is at a more alarming level. As much as the Indian Aviation Industry is competitive, its not that everyone is facing a similar situation. The trend in industry showcases a different picture. Jet being a full service airline has been commanding highest revenue in terms of ASK but on the cost front it’s also the highest one to spend. On the other hand Indigo is lowest revenue generating in ASK but has got a tighter control over its cost. Spicejet fits somewhere in between the two. Do note that the really comparable Airlines with Jet are Air India and Vistara since both are full service airlines. But Air India being backed by government doesn’t worry about small things such as Profit Margin while Vistara which runs 21 Aircraft is too small to compare with Jet. Note: All the above three airlines put together control 72% of the market share as at the end of Q2 FY19. Jet has repeatedly said that rising fuel costs are hurting its margin. We agree to that. The margins have contracted in last three quarters owing to depreciating rupee and rising crude. The crude went from $35 a barrel in first quarter of FY17 to nearly $80 a barrel in second half of FY19. The same has been reflecting in Jets financials, the important point is whether Jet was making profit even when crude was at $35. The answer is No. 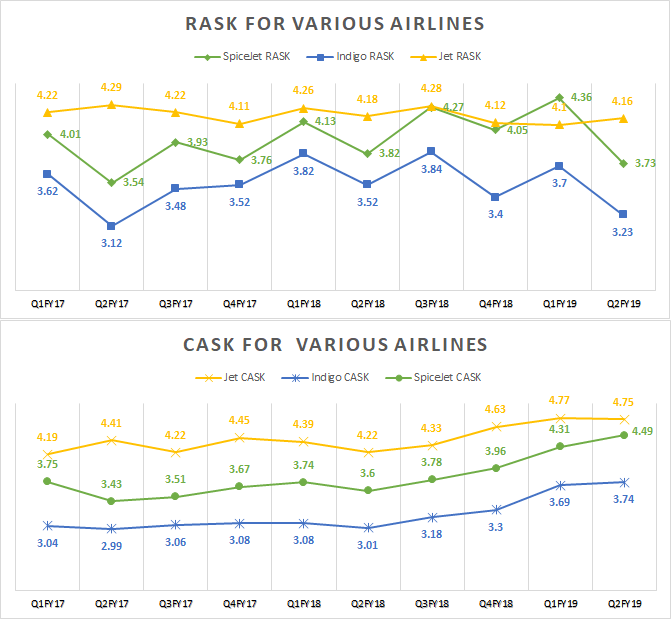 Margins per ASK (RASK – CASK) for Jet airways has always in negative except for first quarter of FY17, where it just around broke even. The same has not been true with other airlines. SpiceJet and Indigo have remained afloat despite all Rupee and crude going against them. 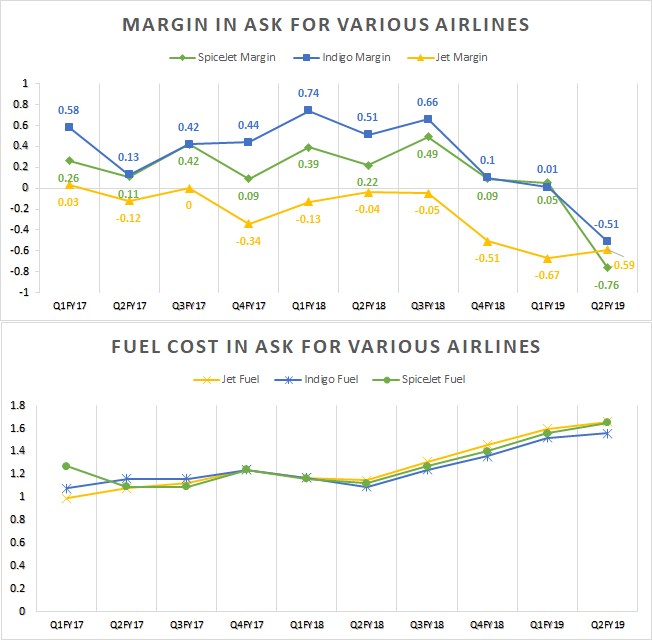 If you see the below graph, fuel prices have increased for all the three airlines in tandem, but the margins have varied. Only for Q2 FY 19 have for the firsrt time, margins have gone into negative territory for all Airlines. If that is not enough, Jet airways has also made Forex losses on account of depreciating rupee in last three quarter. 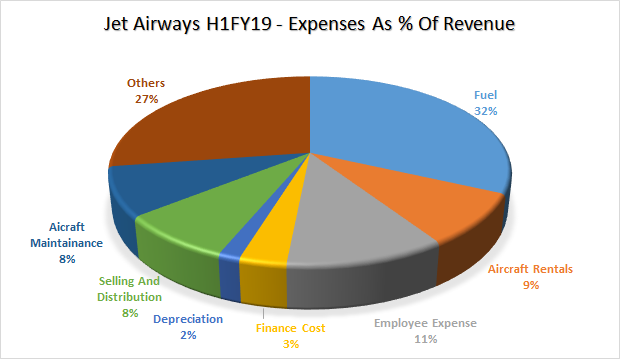 For half year ended FY19, Jet Airways expenses exceeded its revenue by 22%. Most of its expenses are towards maintaining Aircraft operational. Nearly 50% of the revenue is spent on aircraft fuel, rental and maintenance. In addition to Forex losses, impairment of loans given towards its subsidiary Jet Lite (remember Air Sahara?) add to its woes. Jet is not just losing margins, but also losing out market share. This has a lot to do with their inability to add routes even as the total pie has expanded over time. Unless a fast resolution comes into the fore, they may lose market share for none wants to take risks buying tickets of a Airline that may not be in the Air when its time to go. Jet airways was one of the top airlines in the country. At the peak of of its business in 2012, Jet airways was the market leader and commanded nearly 23% of domestic market share. Post that, Jet airways has been unable to compete with other low cost airlines like Indigo and SpiceJet. Over the last 10 quarters, market share of Jet airways have fallen from 19% to 15.4% while Capacity share is also on the decline. The hard question now is, what will keep the airline afloat from crashing. This ins’t the first time Jet Airways is in such trouble. The last time it went through a troubling phase, Etihad Airways, the Government of Abu Dhabi invested Rs.2,060 crores for a 24% stake in the Airline. In addition, it arranged for soft loans as well as buying some assets of Jet Airways. Incidentally, on the same day the deal was announced, India signed a new bilateral agreement with Abu Dhabi expanding the number of weekly seats available on flights between India and the United Arab Emirates (UAE) almost fourfold. What a co-incidence, Right? With the Airline in trouble, the question is whether Etihad will once again prove to the knight in white armor. Unlike in 2013, Etihad itself isn’t doing well with the Airline losing US$3.5 billion over the last two years. Etihad is willing to invest further in Jet subject to conditions. They have proposed a Rs 3,500 Cr rights issue at Rs 160 per share. A discount of 40% on todays closing price. Etihad has said it will subscribe for nearly Rs 2,200 Cr rights issue and increase its stake to 49%. Additional conditions are that it wants promoter share to go below 22% and Naresh Goyal and family exit from management. Naresh Goyal himself has promised to pump in 700 Crores if Banks were to restructure the debt and he stayed on the driver’s seat. According to Etihads letter to SBI, Jet Airways has only one weeks of working capital left with it. So if the resolution plan gets more delayed, then Jet Airways will start grounding its aircrafts. Once the Aircrafts are grounded, revenue starts taking a hit. Very few Airlines have been able to go back into the Air after grounding operations. Jet has valuable slots when it comes to Metro Cities and Indigo and other Airlines shall be the gainers. The Kingfisher Airline saga is very fresh in everyone’s memory. Its doubtful that Banks will allow themselves to be played like they were when it came to KFA. Yet, there is no real answer as to how to restructure the company. If it enters Insolvency court, this will be the first Airline in India. Any restructuring would mean dilution for existing shareholders. Naresh Goyal for now gets to be the decider on how the next chapter will be played out. Once it enters NCLT, the game is up – both for Naresh Goyal as also the existing shareholders.